SensorIO is a powerful and versatile ARM Cortex®-M4, mbed™-Enabled, Internet-of-Things development board targeted to the prototyping and development of connected devices. Its rich set of features makes it a versatile prototyping and development platform for Wi-Fi™ connected products. 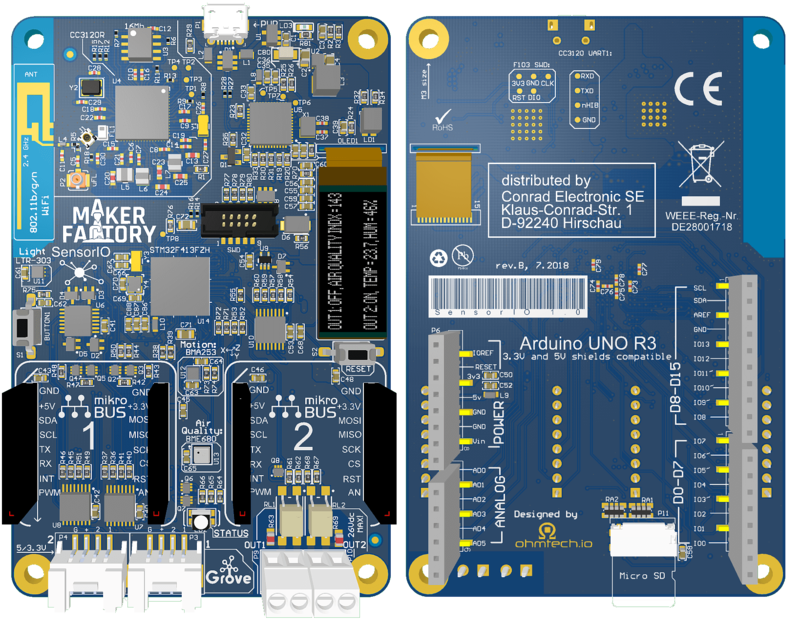 It was designed with flexibility in mind, and unlike any other development board on the market, SensorIO has full support for Arduino R3 shields, Seedstudio's Grove modules and MikroBUS Click expansion boards. This guide will show you the capabilities of the board and walk you through the basic steps needed to create a connected device. Getting Started: if you are anxious and can't wait to start developing, here you will find a quick overview of the out-of-the-box application and will get you up-to-speed with the SensorIO development workflow and tooling setup. Hardware documentation details the different functional blocks and helps the users to understand the functionalities of the expansion interfaces, how to configure the software-controlled multiplexers, list all the peripherals exposed and pinouts and provides technical specifications. Firmware documentation: this section details sensors' drivers and all code facilities for easy SensorIO programming. Note that, even though the board is mbed™-Enabled, thus providing a quick and powerful firmware development platform and ecosystem, the onboard ST-Link™-V2.1 interface can also be used to flash and debug firmware based on different RTOS' or bare-metal applications (i.e. FreeRTOS® + STMicro SDK).